"Serve with cream cheese, butter or your own rhubarb sauce on the side." Preheat oven to 325 degrees F (165 degrees C). Grease muffin cups or line with paper muffin liners. In a large bowl, combine flour, baking soda, cinnamon and salt. Set aside. In a medium bowl, combine brown sugar, buttermilk, egg and vanilla; mix. Fold in rhubarb and walnuts. Add to flour mixture, mixing just until moist. Spoon batter into prepared paper liners. In a small bowl, blend sugar and butter and sprinkle over each muffin. Bake in preheated oven for 20 minutes, or until toothpick inserted in middle comes out clean. 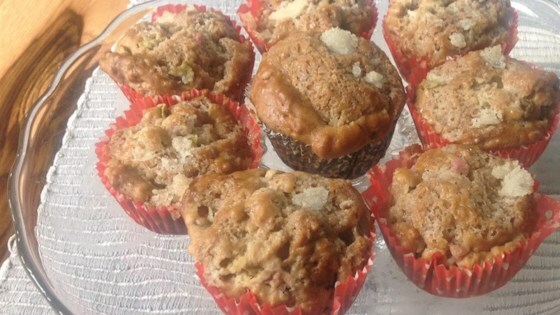 Rhubarb, walnuts, and a sweet, crunchy topping make a magical muffin. The muffins didn't turn out as I expected - very heavy - not cake-like.